Our FA Cup Club Record was smashed on Saturday after another excellent team performance against Potton United. Town scored the highest number of goals in the Extra Preliminary Round and now face Yaxley at home on Saturday 25th August. Town welcomed back Ross Harris from a suspension however Arron Parkinson elected to keep with the same starting line up that produced 2 league wins, which had taken them to the top of the UCL Premier Division. Harris was named amongst the subs with Adam Confue named as captain. The visitors also come in good form, topping the Spartan South Midlands Premier Division themselves, following wins of Stotford and at North Greenford United. 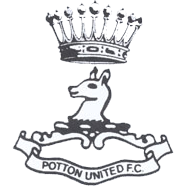 Potton also play at Step 5 having been promoted from UCL Division 1, after finishing second to Pinchbeck United last season. Taylor Orosz made his intentions clear early on when he produced a fierce dipping shot from 25 yards out that 18 year old George Bugg tipped over the bar. Potton came back with chances of their own Danny Hunt fired into the side netting with only Matt Finlay to beat. Finlay did well seconds later when he just got a finger tip to a Hunt cross which was just enough to prevent Aaron Murrell having a simple finish at the back post. Finlay had to be alert again to push a Murrell drive around the post. At this stage it was easy to see why the visitors had started their season so well. They broke with pace and passed the ball well. Town broke the deadlock in the 18th minute when Adam Creaney split the Potton defence with an excellent pass and TAYLOR OROSZ slotted the ball past the young keeper. The lead looked to be short lived as Murrell was standing at the back post to tap home a cross, however the assistant cut short the visitors celebrations by flagging for offside. Then, on 22 minutes, a quality goal out of nothing. LUKE EMERY received the ball out on right flank. He cut inside and curled the ball into the far corner. A goal of absolute quality. It was 3 0 in the 29th minute when Adam Confue put an inch perfect cross field pass over the defender and into the stride of KIERAN FIZGERALD who placed the ball in the bottom corner of the net. Potton still showed belief and Joe Henderson made a brave block the prevent a certain goal. ADAM CREANEY made room for himself on the edge of the box and picked his spot to put Town 4 0 up. LUKE EMERY grabbed his second and Town’s fifth when he stabbed the ball home from close range. The second half would surely be an anti-climax after the first half display I told Dan Elliott. Wrong! Both teams went close just after the restart. Luke Emery’s effort rolling just wide of the right hand post as he got in on the left. It was another special goal from TAYLOR OROSZ on 53 minutes when he chipped the ball in off the far post from an impossible angle. Sublime. Town made two changes on the hour, taking off Luke Emery and Rico Alexander and bringing on Ross Harris and Jordan Orosz. Harris didn’t take long to get in on the act. A Creaney corner was flicked on and ROSS HARRIS was there to smash the ball home for the 7th. Greg Anayitos came on for Kieran Fitzgerald. Potton were trying desperately to get a consolation goal and their efforts were rewarded in the 73rd minute when Jack Goodacre scored from close range. Town scored their 8th goal in the 80th minute when GREG ANAYITOS was put through by Jordan Orosz and he outpaced the defender before poking the ball past the keeper. TAYLOR OROSZ got Town’s ninth in the 85th minute with an unstoppable shot that was still rising as it hit the back of the net from 20 yards out. Arron Murrell pulled another back for the visitors shortly before the referee blow for full time. Last season’s UCL Premier Division Champions Yaxley will visit Elderstubbs on the 25th August for the next round of the FA Cup. Three games, three wins and 17 goals scored. It was another incredible team performance and for the few who watched, a number commented to say it was the best display they had ever witnessed from a Town team. This has the makings of a very good season.